You know when you have a plan for the week? And then by the end of the weekend it’s already looking a bit shaky? Well that’s me this week, instead of quilting the Welsh Blanket Quilt I am looking after a poorly child and trying to keep on top of the washing. But on the plus side I managed to find space to sneak in a bit of machine sewing and then some hand stitching to finish off a project. 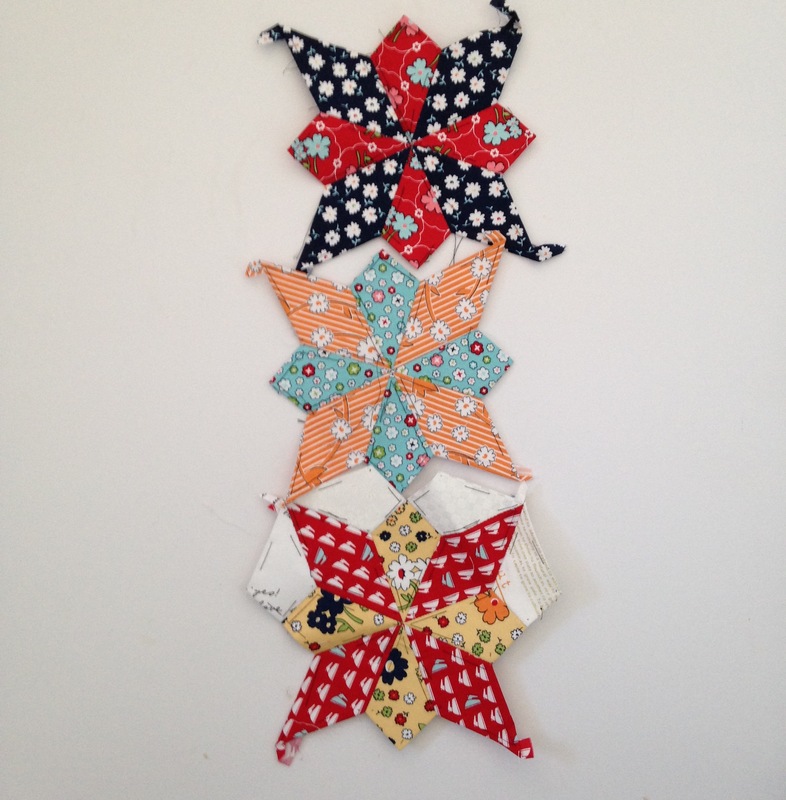 I added a 2″ border and spent some time hand quilting around the flowers so yesterday it was ready for turning into a cushion cover. I didn’t have any invisible zips so decided to add a zip in the middle of the back with a cover flap. 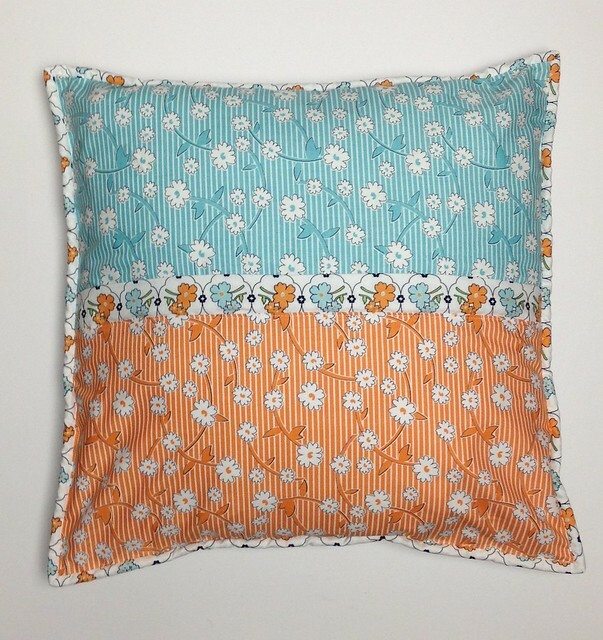 I finished the cushion with a 2″ wide binding strip which results in a narrow binding which I really like. I hand stitched the binding down while sat on the sofa with a dozing poorly child listening to a Clarice Bean audiobook! I really like how this turned out and that’s it’s finished and off my ‘niggle’ list! I’m linking this up to this months Le Challenge which has the theme of ‘Space’ so how to make a tenuous link to this? Well, as I mentioned above I found unexpected ‘space’ in my day to get this finished and it’s also going to fill a ‘space’ on our sofa! Love the tenuous link, they are my favourite kind 😉 The cushion is beautiful and I love the hand stitching! My washing machine is on and poorly child on the sofa (hence being able to comment on blogs! ), I hope yours feels better soon! Thanks for linking to le challenge! I love this cushion! Hope the poorly one is better soon and that no one else catches the lurgy. What a beauty!! 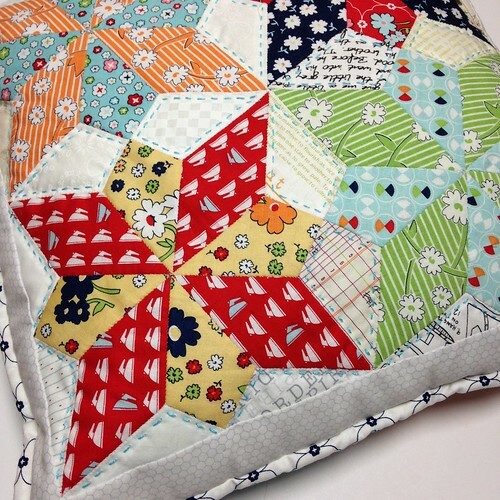 Love everybit of it, the quilting and slim binding look perfect! Great way to check off three to-do’s too! 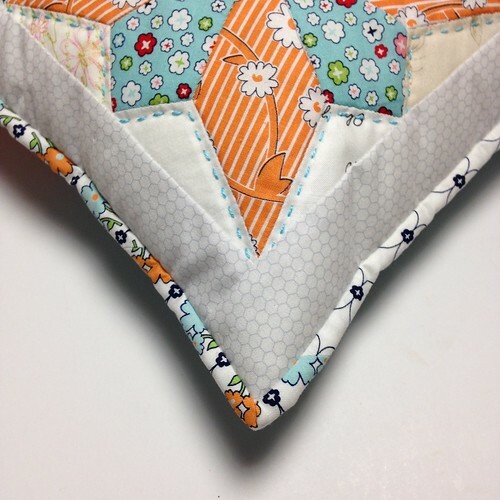 I really like the hand quilting finish to your cushion. I love those moments of peace and quiet! What a beautiful pillow! Such lovely work! What is going on with poorly children. My 10 year old came home early because of a case of the yucks (????) and the nurse told me to keep him home again tomorrow. You are not alone! I hope yours, Lucy’s, and mine get well without infecting us all. It is amazing what being a mother means! I’ll think of you while I am doing extra laundry! Wishing for all to get well for the holidays! A wonderful example of when life throws you lemons…. Love the cushion! What a lovely cushion!!! So pretty. Hope the child is feeling better soon! Really lovely pillow! Nicely done! 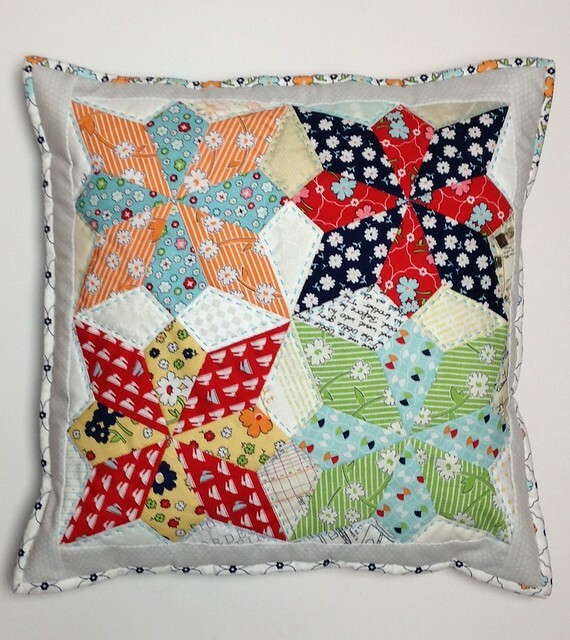 Love your cushion, especially the hand quilting, so pretty!